finally got around to watching the unbearable lightness of being, and i really enjoyed the sets in the movie, particularly this stair that tereza goes through when she visits the engineer. you could say the stair [and prague] is heavy- this is the weight tereza desired when she fled the freedom and lightness of geneva. the stair effectively creates a new layer on top of the building’s facade. 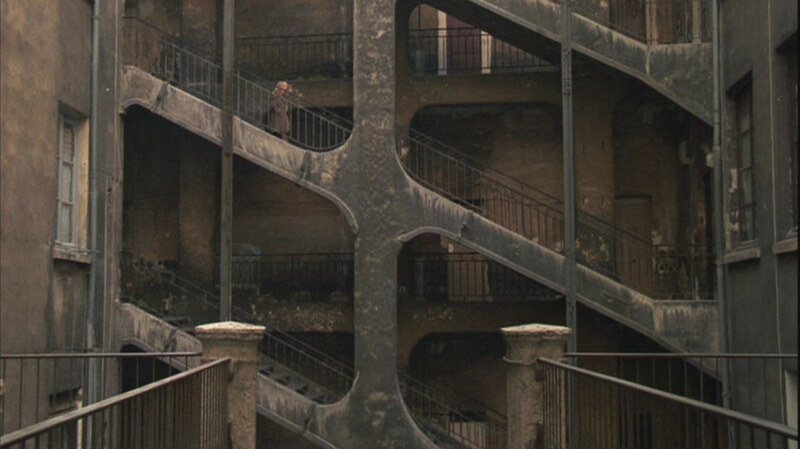 maybe i’m reading too much into it, but besides being a beautiful shot of rather strong architecture, it plays well into the movie: the stair is a mask or a facade that covers the building, just as tereza will now put on a facade and have an affair with the engineer in order to come closer to tomas. ironically, it works, since the engineer himself might be a spy for the government, prompting tereza to propose abandoning everything and moving to the countryside. the couple’s escape from the city is an escape from constant vigilance: feeling they are always under observation, they can no longer function. 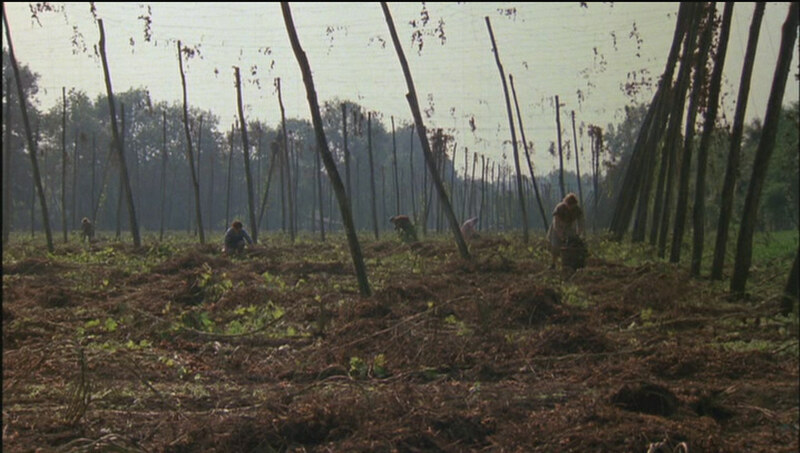 if the city was dark and corroded, the countryside is idyllic. this beautiful set of the fields were tereza and tomas work also takes on architectural qualities through this wonderful shot of the vine structures. the countryside is light, but not the unbearable lightness of geneva, where tereza felt she might be blown away. here life is simple and happy- maybe too happy. for kundera, it might as well end. is it possible to escape these connotations of weight and lightness? semper’s differentiation of stereotomic base and tectonic frame aimed for a balance of built qualities. the movie adds different dimensions to these concepts. here, weight implies vigilance and oppression . lightness is apparent freedom [are we ever really free?]. these categories easily translate into the construction of public and private, urban and rural, but as always, the dichotomies are deceiving. the privacy of the metropolitan crowd and the forced intimacy of the small town reveal the other side of kundera’s story. in the city, thomas could have affairs ‘privately’- he can no longer do so in the intimacy of the country, where everyone knows each other. in a world where these categories constantly blur into each other, can thinking of the built environment as a combination of weight and lightness help us imagine the potential of that blur?